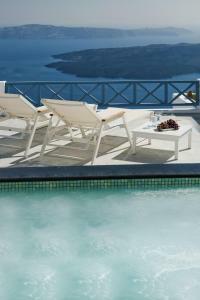 Gorgona Villas is ideally located on a cliff overlooking the volcano and the Aegean Sea. It is near the center of the town of Imerovigli. Its studios and suites have a large furnished veranda with panoramic views. At the reception there is free internet connection. These traditional suites have a seating area with single beds and are ideal for families or groups of friends. The superior rooms are more spacious and have a seating area. Spacious and modern suite with a living room and a kitchenette. This standard cave suite offers traditional accommodation with air conditioning, a TV with satellite channels, a CD and DVD player, a safe, a hairdryer, a fully equipped kitchenette with a mini fridge, a direct dial telephone, bathrobes, slippers, and toiletries. 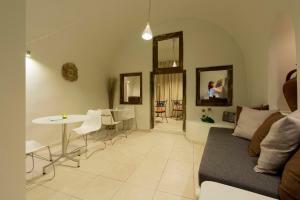 There is a toilet and balcony or terrace with seating area and impressive views of the caldera and the volcano.